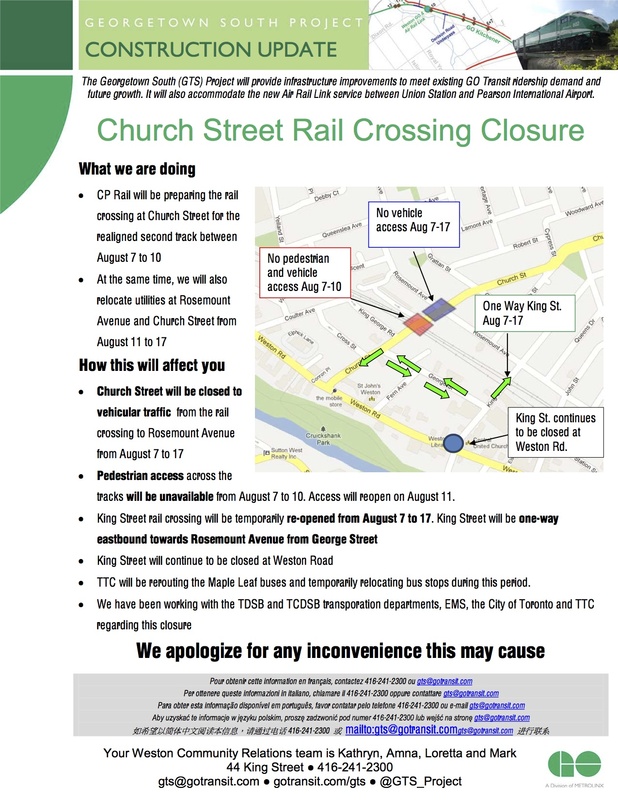 The people at Metrolinx would like you to know that Church Street will be closed to traffic from the rails to Rosemount Avenue from August 7 to 17. Pedestrians will not be able to cross from August 7 to 10. King Street’s rail crossing will be temporarily re-opened from August 7 to 17, but it will be one way only–eastbound–and it will remain closed at Weston Rd. Wow Metrolinx is really pushing buttons of the residents of this mess their creating in the neighourhood. This “inconvenience” wouldn’t be that of a problem if they’re making it for electric affordable fare train or LRT or subway that everybody could use instead of diesel premium fare commuter trains for the few. From the company that is running roughshod over all the neighbourhoods surrounding the tracks, this PR work is laughable. If this is “inconvenience” does that mean that what we’ve experienced already — construction noise at night, unsafe pedestrian access and backed-up traffic on Weston Rd, Church and Lawrence — is just business as usual? Sadly, I guess so. People on foot, people in cars, people in houses, people in apartments, people breathing air — we’re trapped by this mess, and with the results when we breathe carcinogenic diesel fumes. The really nice detail is that our tax dollars are at work here. Don’t worry folks, Laura has decided to “try” to get answers from Metrolinx….are issues will be solved!